Agriculturalism, also known as the School of Agrarianism, the School of Agronomists, the School of Tillers, and in Chinese as the Nongjia (農家/农家), was an early agrarian Chinese philosophy that advocated peasant utopian communalism and egalitarianism, and was arguably the world's first Communist and Socialist movement that believed in a Classless society. The Agriculturalists believed that Chinese society should be modeled around that of the early sage king Shennong, a folk hero who was portrayed in Chinese literature as "working in the fields, along with everyone else, and consulting with everyone else when any decision had to be reached." They encouraged farming and agriculture and taught farming and cultivation techniques, as they believed that agricultural development was the key to a stable and prosperous society. Agriculturalism was suppressed during the Qin Dynasty and most original texts are now lost. However, concepts originally associated with Agriculturalism have influenced Confucianism, Legalism, and Chinese philosophy as a whole. Agriculturalism has significantly influenced Chinese thought, and has been viewed as an essence of the Chinese identity. The Four Books and Five Classics (Chinese: 四書五經; pinyin: Sìshū Wǔjīng) are the authoritative books of Confucianism in China written before 300 BC. The Hundred Schools of Thought (Chinese: 諸子百家; pinyin: zhūzǐ bǎijiā) were philosophies and schools that flourished from the 6th century to 221 B.C. during the Spring and Autumn period and the Warring States period of ancient China.An era of great cultural and intellectual expansion in China, it was fraught with chaos and bloody battles, but it was also known as the Golden Age of Chinese philosophy because a broad range of thoughts and ideas were developed and discussed freely. This phenomenon has been called the Contention of a Hundred Schools of Thought (百家爭鳴/百家争鸣; bǎijiā zhēngmíng; pai-chia cheng-ming; "hundred schools contend"). The thoughts and ideas discussed and refined during this period have profoundly influenced lifestyles and social consciousness up to the present day in East Asian countries and the East Asian diaspora around the world. The intellectual society of this era was characterized by itinerant scholars, who were often employed by various state rulers as advisers on the methods of government, war, and diplomacy. This period ended with the rise of the imperial Qin dynasty and the subsequent purge of dissent. Fajia (Chinese: 法家; pinyin: Fǎjiā) or Legalism is one of Sima Tan's six classical schools of thought in Chinese philosophy. Roughly meaning "house of Fa" (administrative "methods" or "standards"), the "school" (term) represents some several branches of realistic statesmen or "men of methods" (fashu zishi) foundational for the traditional Chinese bureaucratic empire. Compared with Machiavellianism, they have often been considered in the Western world as akin to the Realpolitikal thought of ancient China, emphasizing a realistic consolidation of the wealth and power of autocrat and state, with the goal of achieving increased order, security and stability. Having close ties with the other schools, some would be a major influence on Taoism and Confucianism, and the current remains highly influential in administration, policy and legal practice in China today.Though Chinese administration cannot be traced to any one person, emphasizing a merit system administrator Shen Buhai (c. 400 BC – c. 337 BC) may have had more influence than any other, and might be considered its founder, if not valuable as a rare pre-modern example of abstract theory of administration. Sinologist Herrlee G. Creel sees in Shen Buhai the "seeds of the civil service examination", and, if one wished to exaggerate, the first political scientist. The correlation between Shen's conception of the inactive (Wu wei) ruler responsible for examination into performance, claims and titles likely also informed the Taoist conception of the formless Tao (name that cannot be named) that "gives rise to the ten thousand things. "Concerned largely with administrative and sociopolitical innovation, Shang Yang (390–338 BC) was a leading reformer of his time. His numerous reforms transformed the peripheral Qin state into a militarily powerful and strongly centralized kingdom. Much of Legalism was "principally the development of certain ideas" that lay behind his reforms, and it was these that helped lead to Qin's ultimate conquest of the other states of China in 221 BC.Shen's most famous successor Han Fei (c. 280 – 233 BC) synthesized the thought of the other "Fa-Jia" in his eponymous text, the Han Feizi. Written around 240 BC, the Han Feizi is commonly thought of as the greatest of all Legalist texts, and is believed to contain the first commentaries on the Tao te Ching in history. The grouping together of thinkers that would eventually be dubbed "Fa-Jia" or "Legalists" can be traced to him, and The Art of War would seem to incorporate Taoist philosophy of inaction and impartiality, and Legalist punishment and rewards as systematic measures of organization, recalling Han Fei's concepts of power (shi) and tactics (shu). Attracting the attention of the First Emperor, It is often said that succeeding emperors followed the template set by Han Fei.Calling them the "theorists of the state", sinologist Jacques Gernet considered the Legalists/Fa-Jia to be the most important tradition of the fourth and third centuries BC, the entire period from the Qin dynasty to Tang being characterized by its centralizing tendencies and economic organization of the population by the state. The Han dynasty took over the governmental institutions of the Qin dynasty almost unchanged. Endorsement for the "school" of thought peaked under Mao Zedong, hailed as a "progressive" intellectual current. Li (Chinese: 禮; pinyin: lǐ) is a classical Chinese word which is commonly used in Chinese philosophy, particularly within Confucianism. Li does not encompass a definitive object but rather a somewhat abstract idea and, as such, is translated in a number of different ways. Wing-tsit Chan explains that li originally meant "a religious sacrifice," but has come to mean ceremony, ritual, decorum, rules of propriety, good form, good custom, etc., and has even been equated with Natural law. "In Chinese cosmology, human agency participates in the ordering of the universe by Li ('rites'). There are several Chinese definitions of a rite, one of the most common definitions is that it transforms the invisible to visible; through the performance of rites at appropriate occasions, humans make visible the underlying order. Performing the correct ritual focuses, links, orders, and moves the social, which is the human realm, in correspondence with the terrestrial and celestial realms to keep all three in harmony. This procedure has been described as centering, which used to be the duty of the Son of Tian, the emperor. But it was also done by all those who conducted state, ancestral, and life-cycle rites and, in another way, by Daoists who conducted the rites of local gods as a centering of the forces of exemplary history, of liturgical service, of the correct conduct of human relations, and of the arts of divination such as the earliest of all Chinese classics—the Book of Changes (Yi Jing)—joining textual learning to bodily practices for health and the harmonized enhancement of circuits of energy (qi). Formal logic in China has a special place in the history of logic due to its repression and abandonment—in contrast to the strong ancient adoption and continued development of the study of logic in Europe, India, and the Islamic world. New Confucianism (Chinese: 新儒家; pinyin: xīn rú jiā; literally: 'new Confucianism') is an intellectual movement of Confucianism that began in the early 20th century in Republican China, and further developed in post-Mao era contemporary China. It is deeply influenced by, but not identical with, the neo-Confucianism of the Song and Ming dynasties. It is a neo-conservative movement of various Chinese traditions and has been regarded as containing religious overtones; it advocates for certain Confucianist elements of society – such social, ecological, and political harmony – to be applied in a contemporary context in synthesis with Western philosophies such as rationalism and humanism. Its philosophies have emerged as a focal point of discussion between Confucian scholars in mainland China, Taiwan, Hong Kong, and the United States. The Logicians or School of Names (Chinese: 名家; pinyin: Míngjiā) was a school of Chinese philosophy that grew out of Mohism during the Warring States period in 479–221 BCE. It is also sometimes called the School of Forms and Names (Chinese: 形名家; pinyin: Xíngmíngjiā; Wade–Giles: Hsing2-ming2-chia1). Deng Xi has been named its founder. The School of Naturalists or the School of Yin-yang (陰陽家/阴阳家; Yīnyángjiā; Yin-yang-chia; "School of Yin-Yang") was a Warring States era philosophy that synthesized the concepts of yin-yang and the Five Elements. Si 思 is a concept in Chinese philosophy that is usually translated as "reflection" or "concentration." It refers to a species of attentive, non-rational thought that is directed at a specific subject. The Wu Xing (Chinese: 五行; pinyin: wǔxíng), also known as the Five Elements, Five Phases, the Five Agents, the Five Movements, Five Processes, the Five Steps/Stages and the Five Planets of significant gravity (Mars: 火, Mercury: 水, Jupiter: 木, Venus: 金, and Saturn: 土) is the short form of "Wǔ zhǒng liúxíng zhī qì" (五種流行之氣) or "the five types of chi dominating at different times". It is a fivefold conceptual scheme that many traditional Chinese fields used to explain a wide array of phenomena, from cosmic cycles to the interaction between internal organs, and from the succession of political regimes to the properties of medicinal drugs. The "Five Phases" are Wood (木 mù), Fire (火 huǒ), Earth (土 tǔ), Metal (金 jīn), and Water (水 shuǐ). This order of presentation is known as the "mutual generation" (相生 xiāngshēng) sequence. In the order of "mutual overcoming" (相剋/相克 xiāngkè), they are Wood, Earth, Water, Fire, and Metal.The system of five phases was used for describing interactions and relationships between phenomena. After it came to maturity in the second or first century BCE during the Han dynasty, this device was employed in many fields of early Chinese thought, including seemingly disparate fields such as geomancy or Feng shui, astrology, traditional Chinese medicine, music, military strategy, and martial arts. The system is still used as a reference in some forms of complementary and alternative medicine and martial arts. Yangism (Chinese: 楊朱學派; pinyin: Yángzhūxuépài) was a philosophical school founded by Yang Zhu, existent during the Warring States period (475 BCE – 221 BCE), that believed that human actions are and should be based on self-interest. The school has been described by sinologists as an early form of psychological and ethical egoism. 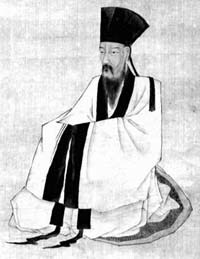 The main focus of the Yangists was on the concept of xing, or human nature, a term later incorporated by Mencius into Confucianism. No documents directly authored by the Yangists have been discovered yet, and all that is known of the school comes from the comments of rival philosophers, specifically in the Chinese texts Huainanzi, Lüshi Chunqiu, Mengzi, and possibly the Liezi and Zhuangzi. The philosopher Mencius claimed that Yangism once rivaled Confucianism and Mohism, although the veracity of this claim remains controversial among sinologists. Because Yangism had largely faded into obscurity by the time that Sima Qian compiled his Shiji, the school was not included as one of the Hundred Schools of Thought.